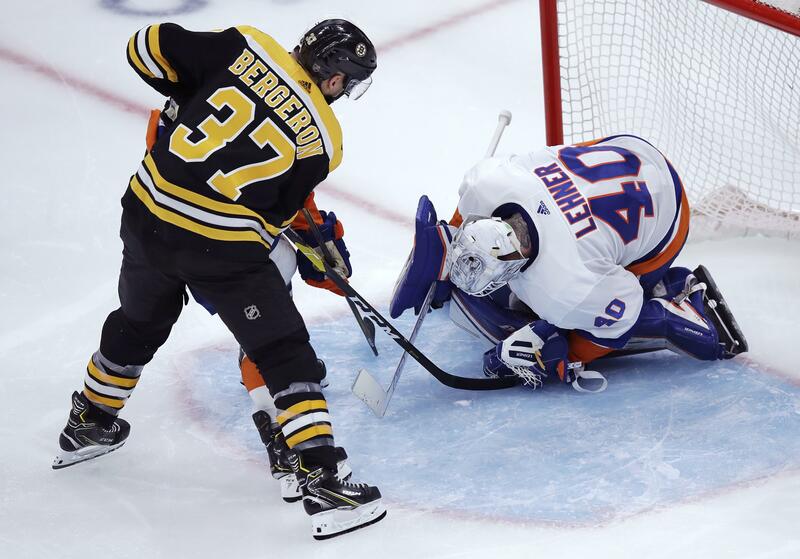 Tue., Feb. 5, 2019, 9:17 p.m.
BOSTON – Patrice Bergeron celebrated his 1,000th career game with a pair of goals as the Boston Bruins beat the New York Islanders 3-1 on Tuesday night. Jordan Eberle scored for the Islanders and Robin Lehner finished with 24 saves. WASHINGTON – T.J. Oshie scored as part of a dominant performance, Braden Holtby made 30 saves and stopped a penalty shot, and Washington beat Vancouver in Jay Beagle’s return to his old home arena. Alex Ovechkin assisted on Oshie’s 16th goal of the season to pick up his 1,180th career point and become NHL’s career scoring leader among Russian players. Ovechkin went into the game tied atop that list with former teammate Sergei Fedorov. WINNIPEG, Manitoba – Joe Pavelski scored a short-handed goal 2:49 into overtime to lead San Jose over Winnipeg. Pavelski’s 29th goal of the season came on a 2-on-1 with Brent Burns after a Winnipeg turnover, giving the Sharks a three-game winning streak to start off a four-game trip. Logan Couture and Marcus Sorensen also scored for San Jose. Kevin Labanc had a pair of assists and Pavelski also had an assist. Martin Jones stopped 25 shots. Blake Wheeler and Mathieu Perreault scored for the Jets, who had their three-game winning streak snapped and their run of seven consecutive victories at home ended. Connor Hellebuyck made 35 saves. PITTSBURGH – Curtis McElhinney stopped 23 shots, Brett Pesce and Jordan Martinook scored from way out, and Michael Ferland and Andrei Svechnikov poured it on late as Carolina began a pivotal five-game trip with a victory over Pittsburgh. TAMPA, Fla. – Alex Tuch scored the only goal in a shootout and Vegas halted a four-game losing streak with a victory over Tampa Bay. Brayden Point and Mathieu Joseph scored for the NHL-leading Lightning, and Andrei Vasilevskiy made 35 saves. Steven Stamkos had two assists to give him 14 points over his last 10 games. NEWARK, N.J. – Tyler Toffoli scored twice in 35 seconds early in the third period to spark Los Angeles. Toffoli, who had the overtime winner Monday against the Rangers, helped send the Kings to their third win in four games. Adrian Kempe, Dion Phaneuf and Ilya Kovalchuk also scored for Los Angeles. Jack Campbell made 29 saves and Anze Kopitar had three assists. MONTREAL – Brendan Gallagher had two goals and an assist, and Montreal beat slumping Anaheim. Jesperi Kotkaniemi and Phillip Danault also scored for the Canadiens, who improved to 7-1-1 in their last nine games. Jonathan Drouin had three assists. Carey Price made 24 saves for his sixth straight victory – his longest winning streak since the 2016-17 season. Captain Ryan Getzlaf scored for the Ducks, who have lost five in a row. Chad Johnson stopped 28 shots. NASHVILLE, Tenn. – Craig Smith, Filip Forsberg and Ryan Ellis scored in the second period, and Nashville beat Arizona to snap a three-game skid at home. Roman Josi scored an empty-net goal with 2:50 left and had two assists, Calle Jarnkrok had a goal, and Ellis also had an assist. BUFFALO, N.Y. – Sam Reinhart scored the lone shootout goal and Buffalo won for just the third time in nine games. EDMONTON, Alberta – Patrick Kane had a goal and an assist, and Chicago scored four goals in less than a three-minute span of the third period. DENVER – Josh Anderson scored the tiebreaking goal with 9:31 remaining, Sergei Bobrovsky stopped 27 shots and Columbus snapped a five-game skid by beating Colorado. Pierre-Luc Dubois scored twice for Columbus, including an empty-netter. Oliver Bjorkstrand, Cam Atkinson and Alexander Wennberg also had goals. Nikita Zadorov, Samuel Girard and defensemen Erik Johnson scored for Colorado, which dropped its fourth straight and fell to 3-12-2 since Dec. 21. SUNRISE, Fla. – Vince Dunn scored with 3:53 left to cap a third-period rally from a two-goal deficit and lift St. Louis over Florida. Aleksander Barkov put Florida ahead 2-0 with a goal 30 seconds into the final period, but Colton Parayko, Ryan O’Reilly and Dunn brought St. Louis flying back for its third straight win. Dunn beat James Reimer with a shot from the slot. Published: Feb. 5, 2019, 9:17 p.m.